As a complex cultural and technical discipline, the contemporary practice of architecture should be connected to current research. Rowell Brokaw Architects has performed specialized research studies, and has a staff with active research interests. We have strong connections to the Department of Architecture at the University of Oregon, and we collaborate regularly on research related to practice. 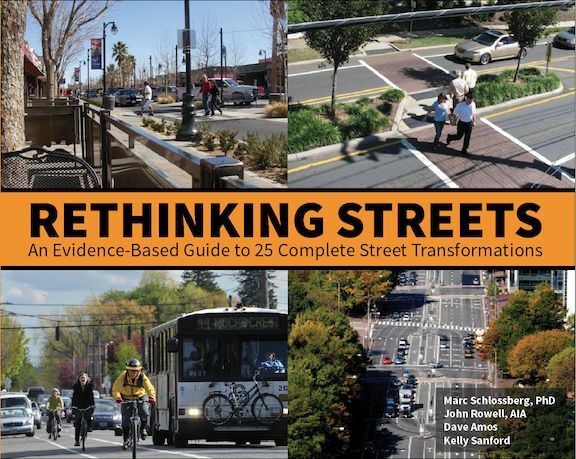 Rethinking Streets: An Evidence Based Guide to 25 Complete Street Transformations uses evidence from completed street projects from around the United States in order to help communities imagine alternative futures for their streets. The book does not show hypothetical street re-designs, but actual examples from typical communities to show how they did what they did and see what resulted from the change. The case studies range from small rural towns to major metropolitan areas, and from light traffic to state highways. Each case study includes information on design, community context, traffic levels and economic indicators--providing evidence readily accessible to planners, community groups, traffic engineers, and merchants. Transforming Architecture: A Festschrift in Honor of Professor G.Z. "Charlie" Brown is a tribute to a University of Oregon professor who has made a profound impact on his students, colleagues, and the field of sustainability. Charlie was among the first authors to describe the challenges that climate change places on architectural resiliency. He has dedicated his career to combating climate change through innovative design, technology, practice, and building operation. In German, Festschrift literally means "festival of writing" and refers to a book dedicated to a highly respected academic and presented during his or her lifetime. The term derives from the Latin term for "book of friends." John Rowell and other friends of Charlie contributed to this book that celebrates Charlie's career and legacy. Making Homes That Work: Planning, Design and Construction of Person-Centered Environments for Families Living with Autism Spectrum Disorder is a resource guide for transforming a home into a supportive environment, enabling an individual with disability to live a more independent, self-directed life. It offers a step-by-step process by which caregivers can assess the home environment and implement modifications that are person-centered and that respect the diversity of family and individual situations. The methods and recommendations presented in the guide are drawn from the authors’ 25 years of experience working on more than 1,500 projects for families and individuals experiencing disability. A series of Case Studies show how families have modified their homes and seen substantial improvements in quality of life and their ability to live together. Here is a link to the first chapter. The Bay Area Project: Housing Design Guidelines grew out of the need to relocate 430 individuals from the Agnews Development Center into appropriate housing in the community. It serves as a guide for converting and building various housing types for individuals with disabilities. Housing Types are combined with Building Programs, based on individuals’ needs, to form Housing Templates that can be replicated and adjusted. A case study follows each template, illustrating the benefits of these designs on specific individuals. Many of these case studies feature people from the Agnews Development Center. Ultimately, successful integration involves transforming home environments into empowering, supportive spaces that allow individuals to have choice, control, and participation. Chambers Reconsidered: A Citizens’ Guide to Potential Design Guidelines for a Mature Neighborhood was developed for the City of Eugene as a guide to the character and patterns of development in the East Traditional Neighborhood (ETN) in the Chamber’s area of Eugene. As with many traditional neighborhoods, this Pre-World War II development is within walking distance of downtown and is a desirable place to live. The guide is intended to give citizens and officials the tools to understand what makes this neighborhood unique and to identify specific ways that future development in this neighborhood can integrate with the existing housing. A balance is struck between carrying on a strong tradition and allowing the individual control and discretion that preserves vitality. “The Re-Emergence of Local Shopping Districts in Portland, OR” was developed for the 17th International Seminar on Urban Form in Hamburg. The presentation for this conference looks at three streets that are in the process of commercial revitalization in Portland: N Williams Ave, NE Alberta Street, and NW 23rd Avenue. The streets were studied through direct observation, interviews, and research. The presentation explores “how development gets started in the first place and how it might be helped along,” and it includes a set of guidelines intended to help policy-makers, property developers, and business owners in making sound decisions about location and investment. Here are links to the presentation transcript and slideshow. “Improving the Effectiveness of Large Capacity Lecture Halls” was a presentation delivered at the 2016 Environmental Design Research Association (EDRA) Conference. 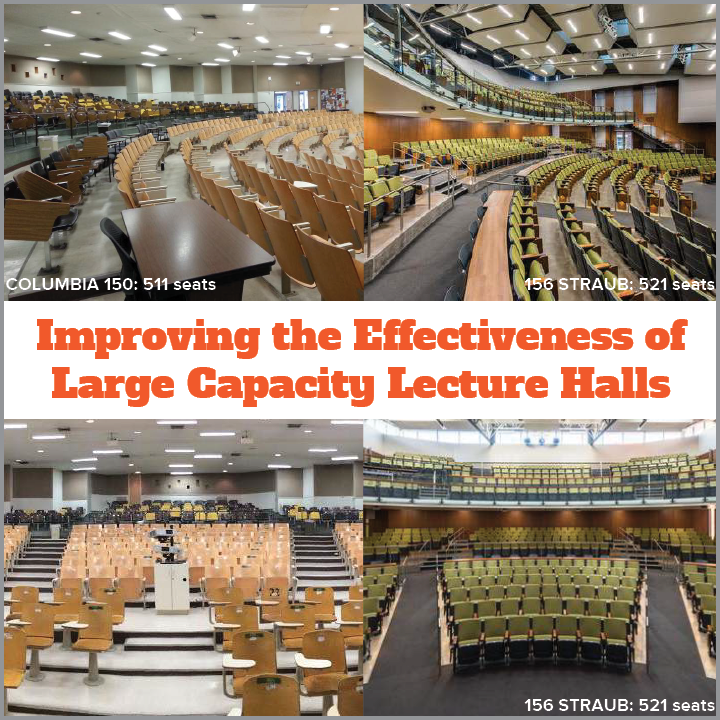 The presentation compares two large capacity (300 people plus) lecture halls at the University of Oregon in order to explore how the design of large lecture halls can be improved to increase their effectiveness as places for students to learn. The same classes taught by the same teachers to the same kinds of students were observed in 150 Columbia Hall before it was renovated and 156 Straub Hall just after it opened. Behavior mapping of student and teacher interactions, student surveys, and one-on-one interviews with faculty and students were used to assess how differences in geometry and overall room quality affect the variety of teaching modes, student-teacher interactions, student attendance and timely arrival and departure, and student attentiveness. Here are links to the presentation transcript and slideshow. “The American Head Start Program: A Prototype for New Facilities” was a presentation delivered at the Designing Modern Childhoods Conference at the University of California in Berkeley. After a brief history of the Head Start program and a discussion of the ideals and applications for site selection and architectural quality, the presentation outlines key design elements for Head Start facilities. Entrance Transition Space, Sunny South-Facing All-Weather Playground, Variety in Heights, and Pools of Light are a few examples of these elements or patterns. The intention behind these design elements is to create as strong an architectural program as the teaching curriculum. Establishing basic elements to guide design can add incredible richness. Here are links to the presentation transcript and slideshow. To expand research capacity in special areas of interest, the firm established in 2007 the Rowell Brokaw Student Research Fund. The fund supports two graduate students per term to conduct research.